Your time in the kitchen should be a celebration, especially when you share it with your child. Any recipe becomes a special event when you're both decked out in these exuberant and joyful aprons. Layered in fantastic frills and bright floral patterns, this is the perfect attire for mixing up happy memories. 100% cotton. Made in India. Women's: one-size fits most. Kids': fits most ages 3-7. Machine wash. Dry using low heat - and remove while still damp to minimize wrinkling. Please note, these items are discontinued. When they sell out, they will no longer be available. I am not so much a "darling" person, but this is darling but in an ethnic, not over-the-top cutesy way. It has good coverage too. I want to add that the first one I ordered still has not arrived, but when I emailed the company, they called me at home within the hour, and UPS delivered it at their expense. They even offered two day Express, but I decline. Rare to find such good customer service anymore. This apron is very cute and my 2 year old loves wearing it. It's a little big on her, but that's a plus with how quickly she grows. I just wish it was wash and wear. Toddler clothes should not require hand washing and line drying. What mother has time for that? My Aunt loves to cook and her daughter ( now 3) has been very keen on helping. This gift proved to be a success. Mom and daughter can cook together and my cousin can wear her adorable apron. I love the look of the apron but the straps aren't adjustable so it hangs down too low. It would be helpful if you could tie the top strap or had some other option to make it adjustable. The aprons are fun and unique. However, they lack an adjustable top strap (D-ring). We will have ours adjusted by a tailor for a good height fit. We bought this apron for our teenage daughter, along with a cupcake cookbook and other materials. She absolutely loves the apron! She's petite so the adult size is a bit large, but with a little alteration it fits perfectly. The colors are festive yet vintage at the same time. I'd read reviews about the fabric being too thin, but it seems good quality to me. It's definitely cotton and it reminds me of the dresses and aprons that my great-grandmother wore. Love it! Sprang for the mother/daughter set because it looked so cute. Disappointed by the cheap fabric. Sent them back. I am giving this to my sister who entertains a lot. I think she will be super stylish in this particular apron. Its so pretty, she may figure out how to wear it as a shirt. :)). 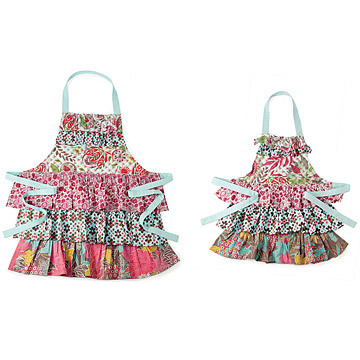 Matching mother/daughter aprons will help to make your time together in the kitchen memorable. Layered in frills and bright floral patterns.